Hey guys, Spencer here. I’ve had a lot of people reach out to me that are interested in buying a business. It seems as though more people are starting to realize how possible it is to purchase a pre-existing business that already has cash flow and customers rather than spend years building one from scratch. I’ve bought several myself and I love sharing what I know, but this time I wanted to invite some guests to share from their own experience. Thinking of Buying an Online Business? Get Hayden and His Team's Complete Overview on How to Buy an Online Business Now! First off is an interview with Hayden Miyamoto. Hayden has started a couple of different firms that collectively have bought over 20 businesses in the last three years, so I’ve invited him to share his thoughts. He also just started a new company called Kingmakers that is an accelerator that helps people buy their first business. Spencer: Hayden, welcome back! If you would, please give us a little more background on yourself and your story. Hayden: Thanks for having me again Spencer! Yeah, so I started out in online entrepreneurship when I was 17 years old after dropping out of high school. I’ve never actually had a real job, so to speak, and I’ve founded pretty much every type of online business you can think of. My MO recently has been to bring down small groups of aspiring entrepreneurs to this small town in Mexico I live in, train them on how to operate online businesses, and keep them on as managing directors of those business. Originally that was with businesses I had founded, and then over the last several years it’s been with businesses we’ve acquired. Where I really cut my teeth was co-founding Wired Investors. We purchased just shy of 20 online businesses in the space of a couple years, most of which we still own and operate today. Deven, Neil Patel and I also founded Media Block this last summer and are purchasing some larger deals there. Spencer: That’s incredible. Now with buying that many businesses, you had to have made plenty of mistakes. What do you think were some of the most valuable mistakes you made and learned from? Hayden: There’s a phrase I like to use — “move fast and break things”. Essentially the idea is to completely immerse yourself in something, take massive action, and pack a lot of mistakes and therefore valuable learning experiences into a short period of time. This is basically what we did with Wired Investors. We wanted to get a large gamut of experience in the space and then learn from those mistakes and figure out what our strengths were. So we bought all sorts of online businesses. We bought a lot of media publisher businesses, we bought SaaS businesses, we bought productized services, we bought service-based businesses…you name it. And that was the first real learning experience; figuring out exactly where our sweet spot was. The other major thing we learned is how important deal sourcing and due diligence is…how important it is to get right and create this bullet proof process for finding and analyzing a business you want to buy. It took quite a bit of time, but I would say dealflow and diligence is our greatest strength now. We’ve developed a lot of proprietary systems and even software that gives us a significant edge over the competition and allows us to efficiently help other people buy online businesses at great valuations. Spencer: For sure, I mean if you want to buy a business, finding the ideal match and then being able to ask the right questions and gather the right information on it before you drop a lot of cash is obviously incredibly important. Can you go a little more into depth on that? Hayden: For sure. I mean at the end of the day, like you said, it’s just asking a lot of questions. What takes time and experience is knowing what the right questions are. But taking a step back to dealflow and sourcing, what we really excelled at was creating systems that significantly cut down the time it took to find great deals. At the end of the day, it’s a numbers game. We probably initiated 50,000 conversations in order to buy those 20 businesses. As you can imagine, that could have potentially taken years. Instead, we created and used a repertoire of robust systems and tools to automate the process of reaching to thousands of businesses, follow up with them, get on calls and essentially find an interested seller and a great business that fit our target mandate. Then, once you find a business you like and seller that’s willing to sell for the right price, your next goal is to do your diligence and get an LOI in place. Due diligence is where you really start asking detailed questions. Questions about how the business operates, questions about it’s traffic, questions about how it’s monetized and much more. You’re not done after that either. Next, you want look for and identify all the possible risks that would come from possibly owning that business, and more importantly create a plan to mitigate those risks. Then you are going to want to focus on all the opportunities that exist and create a very detailed growth plan so that after you buy the business, you have a clear roadmap towards the appreciation of your new asset. It may seem daunting at first, but that’s why we exist. We have the entire process down to a science, and now we’re helping other first time business buyers succeed at scale. 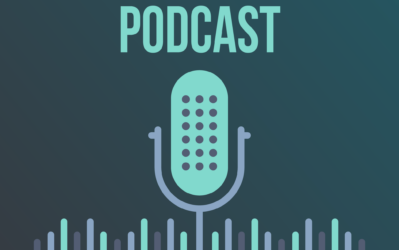 If anyone is reading or listening to this and you’re intrigued, we would love to chat with you. We’re always happy jumping on the phone to answer any questions people have on the process. Spencer: For those that are interested in learning more, Hayden’s team at Kingmakers is offering free 1 on 1 calls. You can head to this page to register. So taking a step back, in your own words, why would someone want to do this? What do you love about buying and running online businesses? Hayden: Well it’s a pretty personal reason for me but also kind of practical. You know, when you’re looking at an online business, often it's one that can be run from anywhere. I mean, let’s say you choose to buy an offline business instead. Let’s say a laundromat. Maybe the best laundromat for sale is in Omaha Nebraska. It’s low risk, has great cash flow, and the seller is willing to let it go for a very reasonable price. That’s all great but, well, you may not want to move to Nebraska. Whereas with the vast majority of online businesses, you can run them from everywhere and there's typically a host of experienced staff, operators, providers and agencies you can hire globally to help manage the business. It’s also easier to scale. Take the previous example of the laundromat and let's say you want to build a laundromat empire. You go and buy that one in Omaha and then ideally you would want to find another several in the same city to truly get the benefits of scale, but this might not be possible. Instead, you could end up owning separate laundromats in different states hundreds of miles apart. It’s of course possible to build a business like this, but it would be difficult. What’s far easier is buying online businesses and being able to relocate them anywhere and work on them from anywhere. With online businesses you can also scale globally and tap into other markets with more ease. It’s easier, it’s faster, and it just scales better overall. Another reason I love this type of asset is because it’s very easy to passively own them as opposed to an offline business. If we would have bought 20 local offline businesses, we would be far more involved in the day-to-day operations than we are now. Whereas with these online businesses it’s very easy to be a passive owner and let the business work for you. There are many other reasons, but those two stick out to me the most; your ability to scale and then become more of a passive participant in the business. Spencer: A lot of people think there are major barriers to buying an online business and so they never take action out of fear. Can you dispel these? Hayden: Yeah I think a lot of people get stalled in this process for a few reasons. One being that I think they go to these sites and platforms where these deals are listed and they don’t find anything they are interested in. That or they might feel it’s overwhelming and just give up. It’s important to understand that there is just a giant, giant world of businesses out there beyond the ones you see on your typical broker sites. All it takes is the right method and some good old fashioned elbow grease to go out there and find those diamonds in the rough. They key to not being overwhelmed is to get really clear on your investment thesis. That is, the exact type of business you want to buy, how you want to buy it, etc. This way you can quickly filter through and say no to anything that doesn’t meet your target mandate. Your mandate would include things like, what niches you’re interested in (which should align with unfair advantages you have), what type of business you want to buy (a publisher vs software as a service for example), and what your target multiple, deal-size and offer structure is, which will often depend on your financing. Spencer: That’s a great point. I think another barrier people perceive is how to go about financing the purchase of a business. Can you elaborate on that? Hayden: Let me assure you, it’s easier than you think. There are so many ways to close a deal that you are basically limited by your own creativity, which can seem daunting if you’re just starting out in the space. First things first, a large part of what attracts people to this space are the low valuations they sell for. We buy businesses for 3x their annual profit. Meaning if a business is making $100,000/year, we buy it for $300,000. Assuming the business doesn’t grow and doesn’t decline, this delivers a 33% per year return. However, because the space is still in its nascency, structuring a deal with 25-30% “seller financing” – which is the equivalent of a vendor-take-back mortgage – is quite common. This financing is generally at a 8% interest rate, so you’re looking at 25%/yr profit there. Next, there are tons of banks that are willing to make loans with the same types of interest rates. Basically as long as you have a decent credit score and some cash for a down payment, there are a variety of different ways we can connect you to financing and help you close. Our specialization is in helping people purchase a business that is earning anywhere between $300,000 and $1mm in profit per year. Let’s say you wanted a business making $300,000/year, with a purchase price of 1mm. With the right structure and financing, you can put down $100,000 for that business, and make 80k per year AFTER debt repayment (assuming the business just stays flat, doesn’t grow and doesn’t shrink). That’s an 80% ROI, and you could turn around and flip that business after 3 years with over $250,000 in profit, or you could hold onto it for the cash flow. If you only have $20k to put down, just divide those numbers by 5. You don’t have to be a millionaire to do this! Spencer: So, what type of person is the best fit to purchase an online business? Hayden: That’s a great question. We’ve really seen two types of people that are interested and that seem to be great candidates. The first type is people who are more entrepreneurial in nature…meaning people that have previously started businesses from scratch, and they know how hard it is to bootstrap it from the ground up. You spend the first couple years without much of a paycheck and you spend a bunch of time developing your product, building your customer base and building a successful organization. So we see a lot of people who have done this and succeeded or had a harder time of it, and instead of doing that again, they are ready to short cut that process and buy an existing business…something that already has some legs. The other type of person we see are people who have had more of a traditional career path. They’ve worked in, say, the corporate world for many years, built up some savings, and now aren’t as excited about the path they are on and are looking for a change. Now they are looking to be a little more independent, but they don’t want to go from having a stable job to earning much less by starting a business from scratch, and so the idea of buying a business with existing customers and cashflow is really appealing. It’s exciting for us to talk to these kinds of people and reveal just how possible this is, and that the barriers to entry are much lower than they may think. Spencer: What are the types of things that someone can do to an online business that hasn’t already been done by the founder to accelerate its growth? Hayden: One thing that we’ve seen is lacking across the vast majority deals is conversion rate optimization. Nobody does it, but everybody should. It doesn’t matter what the business is. Just doing things like A/B split tests, price testing, initial usability tests to make sure the site is optimally designed and other related things makes a huge difference in the improvement of the business. We can generally count on getting an automatic 30-50% lift on any businesses that we buy by doing things like this, and out of all the businesses we’ve looked at, I’ve literally never seen one that has actually said for example “yes, I’ve done price testing on some kind of SaaS offering” or “yes, I A/B test my highest traffic pages every month”. It blows my mind that more people don’t do these things, but it’s an easy win for us. Even simpler, if for instance the business is monetizing via affiliate links and commissions, nine times out of ten we can negotiate a better rate, and nine times out of ten the seller has never tried to do this. It’s the simplest win ever. Spencer: Love it man and I really appreciate you sharing your knowledge. Before I let you go, let us know one more time how people can get involved in what you are doing. Hayden: For sure! So you can find us at kingmakers.co. Please feel free to get in touch with us, especially if you are seriously interested in buying a business. We’ll ask you some questions and let you know how we can help. We are also hosting a business buying workshop in Mexico in April this year. We’re only accepting a small number of applications so it will be an intimate in-depth experience. We’re essentially going to pull back the curtains on our private equity firm that acquires and operates six plus new businesses per year. At the end of the conference, we will be partnering with a select group of attendees to source, diligence, and acquire their own deals. It’s going to be a great time and I hope to see you there! Next we have a great post from Stacy Caprio who is the founder of Growth Marketing. Stacy is going to break down four lessons that she has learned in her business buying experience. She has made all the mistakes so you don’t have to! Opening your computer screen and seeing revenue numbers like this doesn’t happen by accident. Read this article to learn how you can avoid my mistakes and how to purchase sites that will be profitable, returning your investment in a one to two years and then offering purely profitable positive cash flow into your bank account. 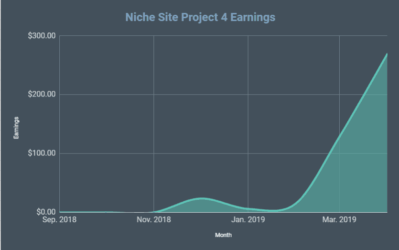 Part of the reason I’m writing this article is to give back to the Niche Pursuits community, as I would not be in the position I am today or a successful website owner if it were not for some of the articles I’ve read on the website. I’ve been a Niche Pursuits email subscriber for a few years, and I’ve found the information in their emails to be incredibly valuable. 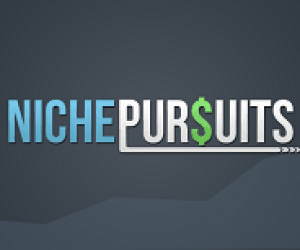 When I see a Niche Pursuit email in my inbox I either read it right away or star it so I can read it in the near future. I first heard about the idea of buying and selling websites in a Niche Pursuits email article, and a few months later that article is the reason I decided to purchase my first Flippa website. I’ve made a lot of mistakes buying websites, which I want to share with you here so you can avoid making similar, quite expensive, errors like I did. I have also learned a lot from these mistakes and have a few successful site purchases that I will continue to grow and build on. I plan to invest my successful site proceeds into more website purchases as they continue to bring in revenue. My first visit to Flippa, I was very curious, open and completely naïve. I saw all these revenue numbers for sites and my mind was blown that they could all be making that much money! 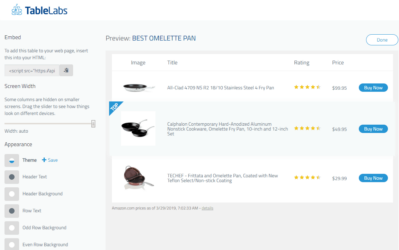 I found a site that claimed to be making $350/month from Amazon affiliate revenue. I asked what they would be willing to sell for, and we negotiated $1,300 for the site, less than a 4X monthly valuation. I was so excited to purchase my first site and thought it was such a good deal that I completely trusted the seller and did not second guess, look into, or even use my common sense to check the revenue numbers. The owner posted a few sales screenshots and sent me some revenue number screenshots, but looking back they were likely revenue screenshots of his entire account lumped together, not just the site he was selling me. Turns out the site was only making $20-50/month on a good month. It really hurt to be tricked like that, but, it was an incredibly valuable lesson to learn as I never made the mistake of overvaluing a site again. Looking back, being able to purchase a site for under 4X monthly valuation is in itself a huge warning sign. If you see a site selling for anything less than a 5 or 7X monthly valuation it stands out to me in big red as a scam or lie. 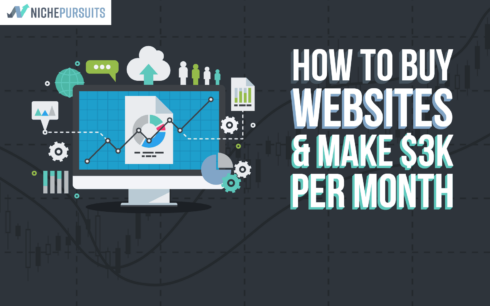 Most site owners have worked hard to build a site, and if it is valuable and making them an income every month, they will work to explicitly verify their revenue and get a decent 15X+ monthly valuation price. One great feature on the Flippa site is “verified revenue” numbers for all sites that make revenue via Adsense. Flippa also verifies page views and visitors via Google Analytics. When I look at sites now, I only consider sites with both verified Adsense revenue and Google Analytics. This site also did not have verified revenue numbers, as it made money as an Amazon Affiliate site. It did have verified Google Analytics numbers, however. I could have easily used my common sense and looked at the Google Analytics data to realize the site owner was lying about the $350/monthly revenue. 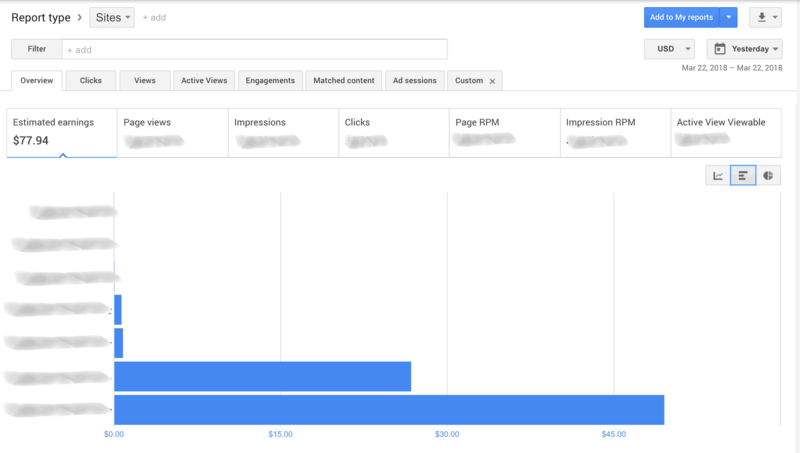 The Google Analytics traffic averaged 1,000 visits a month, so even at an astronomical 5% conversion rate, that would be 50 conversions a month, making around $1 or less/conversion. I would have easily been able to tell the site was making well under $50/month if I had applied some common sense and basic math skills before pressing the buy button. There is no reason not to buy an FBA or affiliate site as long as you thoroughly look into the numbers and use the common sense to double check the numbers using Google Analytics data and industry average conversion rates, which I did not do. The main takeaway from my lesson learned on this site is don’t be too eager, and look at the site objectively and carefully before you make an offer. My second site purchase was also made in a poor state of mind, desperation to find anything I could buy that would make me over $1,000/month so I could quit my job. Being in a positive, neutral state of mind while purchasing a site is something that will help you avoid making huge mistakes. 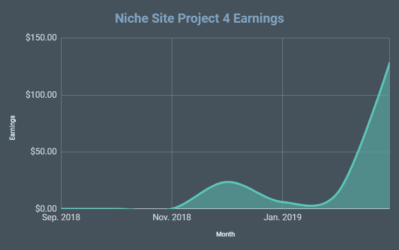 This time, with my newfound appreciation for double-checking and verifying site revenue, I found a site making $500 “verified Adsense” revenue a month. Looking at the Google Analytics and doing a basic RPM calculation, I realized the site could easily make double or triple that with an ad provider switch provided the traffic stay stable. I made an offer and purchased the site at a 20X monthly valuation. At first the traffic stayed stable and I was able to double the monthly revenue to over $1,000/month by switching ad providers. Turns out my assumption that “traffic would stay stable” was completely false in this case. In a better state of mind, one other than pure desperation to have a profitable asset, I probably could have seen this coming, but as it was, I was desperate. The site was an iPhone game app answer site. Game applications have a half life of 6 months, and a few months in traffic started to sharply decline. As of today, 1 year later, I’ve made back 75% of the website cost and it continues to return minimal revenue, however I still look at is a failed investment and lesson learned. Your takeaway from this is to only invest in long term ideas and sites, not ones that are passing trends, games or fads. Don’t make my mistake again, and I know I never will! My third website was a two-site combo, which I of course carefully verified the revenue on and picked a stable niche. A bonus of my third site is that it has a committed community that continually generates content for the site, making it completely hands-off for me. I bought this site at a fair 20X monthly valuation, and knew I would be able to at least double the ad revenue, making it back much sooner. I was able to increase the monthly ad revenue from $370 to $1,200/month by partnering with several different ad providers. It’s been 10 months since I purchased the site and I’ve made back my entire initial investment + an additional $1,600 in pure profit. I continue to make $1,200/month in pure profit from the site. A key and often underlooked component of buying a website is being in a good state of mind. When you are not desperate and are able to be objective, you’ll be able to evaluate a site’s revenue accurately, pick a stable niche, and make an offer that is fair for you and the seller, creating a win-win situation for everyone involved. My first site I purchased with a very small investment, which is what I recommend to anyone purchasing a site for the first time, since it is a risk, and starting small allows you to minimize the risk while still learning and possibly making a good deal. My fourth site is the biggest investment I’ve ever made, aside from stocks. I purchased it a month ago at an incredible deal, a 10X monthly valuation, which I was able to do with a special technique I’ll outline below. I call this the “expired site” technique. I filter on Flippa to see sites that meet my minimum monthly revenue goal that are also no longer active auctions. This means they have previously been put up for auction but no one bought them. This means you have no competition when negotiating an offer and are speaking with someone who wanted to sell their site but was previously unable to. I’ve found the best deals are often found this way because they are often very profitable sites other people have overlooked. This site has huge organic search potential and my goal is to double the organic traffic by next month, meaning I could see a full investment return in 5 months or less if I’m successful increasing the traffic. Even if traffic stays the same, a 10 month return is a very good deal and not something I would be disappointed with. Remember, after the 10 months when your investment is returned, all revenue becomes pure profit. To find good deals on sites, focus on sites others have overlooked and search using the “expired site” method. Also focus on keeping your offers at a 20X valuation or under to get the best deal. 20X valuation is the accepted standard on the Flippa marketplace. Have you learned a lot, and are now ready to make your own first purchase? I bought all 4 of my websites on Flippa.com because it is a site where if you look closely you’ll be able to find great deals. However, Flippa sites are often lower ticket sites and if you’re looking to spend upwards of $40K, you’ll likely have to look elsewhere. Empire Flippers is a great site with much higher ticket and value sites. They pre-vet and verify sites beforehand so that you don’t have to be as careful vetting in advance because the sites are generally legitimate. The only downside to Empire Flippers is you pay a premium monthly valuation, generally 30X, as opposed to the 20X or under deals you can find when you look closely at Flippa. Empire Flippers also takes care of the entire transaction for you, including transferring the site, which takes away the hassle for those with no website transfer experience. There are other ways to find and purchase great sites including simply sending an email out to your email list if you have one, or posting in website or investment Facebook or Linkedin groups, which is exactly what the owner of Niche Pursuits did when purchasing his brand new site, a mom blog , for a price in the six-figure range. Think creatively, such as the type of person or group who may already own your ideal website, then think of ways to contact them. There are many people who own profitable websites, now it is your job to think of who and where they might be, and how you can get in touch with them. The more creatively you think, the more opportunities you will have to find amazing sites. 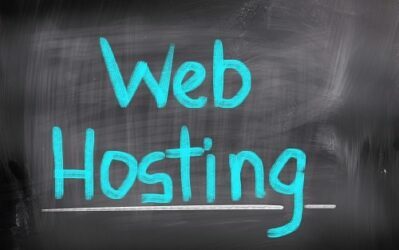 I also offer a website buying service where I take care of finding a profitable site, negotiating and purchasing the site, transferring the site to your host, and offering advice how to increase the traffic and profit. Feel free to contact me if you are interested in learning more about how to hand the difficult parts off to me to buy a profitable website asset. To negotiate a great website price, you’ll have to get and verify all the stats, privately message the seller to get more information and build some trust and rapport, then formulate the price you are willing to pay in your mind which ideally should be 20X monthly valuation or under, then ask the price they are looking for. If the price is under your maximum monthly valuation, then make an offer and you will have a new site at a great price with lots of potential to make the investment back plus much more as time goes on. Thak you so much for sharing this. Fantastic Article to read. Wow, very interesting topic you have there.. it’s always a good idea to learn from the experts, if only I have the cash to do all this kind of stuff then, I will definitely follow the steps just like what you did..
Great to read! I also did quit my full time job to go fulltime online. I make between $2000 – $3000 monthly now for the last 6 months but hope to double that in 2019 as I am working on it fulltime now. My plan is to buy new assets that already make money. My main site is exactly what you described. I spend 3 years aside my full time job building it from scratch, but gave me the freedom I have now. But, it is really a lot of work while you can buy sites that make $300 – $500 for like $6-8k. Unfortunately it is not easy to find them. You really need to search and I did buy 3 sites in 2018. 1 site making 1200 eur a year. 1 site making 700 eur a year. 1 site making 100 eur a year. Not really the sites I am looking for. I am looking to buy a site that makes more than 300 eur a month now but it is really not easy to find. Flippa is no longer my goto place for buying websites. It is filled with dropship and e-commerce sites and very few websites there actually look legit and recently they disabled the comment feature.